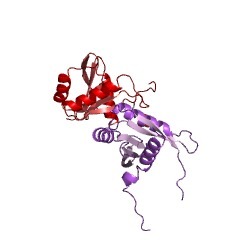 Likely ribonuclease with RNase H fold. YqgF proteins are likely to function as an alternative to RuvC in most bacteria, and could be the principal holliday junction resolvases in low-GC Gram-positive bacteria. In Spt6p orthologues, the catalytic residues are substituted indicating that they lack enzymatic functions. 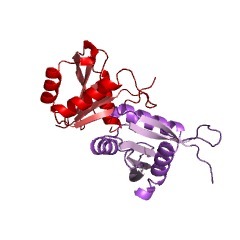 The YqgF domain family is described as RNase H-like and typified by the Escherichia coli protein YqgF [(PUBMED:10982859)].YqgF domain-containing proteins are predicted to be ribonucleases or resolvases based on homology to RuvC Holliday junction resolvases. 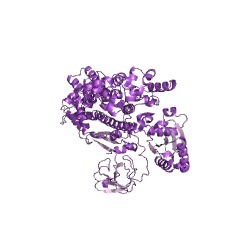 The group of proteins containing this domain are found primarily in the low-GC Gram-positive bacteria Holliday junction resolvases (HJRs) and in eukaryote orthologs. The RuvC HJRs are conspicuously absent in the low-GC Gram-positive bacterial lineage, with the exception of Ureaplasma urealyticum(Q9PQY7, [(PUBMED:10982859)]). Furthermore, loss of function ruvC mutants of Escherichia coli show a residual HJR activity that cannot be ascribed to the prophage-encoded RusA resolvase [(PUBMED:8648624)]. This suggests that the YqgF family proteins could be alternative HJRs whose function partially overlaps with that of RuvC [(PUBMED:10982859)]. The functions of eukaryotic proteins having this domain are less well described. In Saccharomyces cerevisiae (Baker's yeast) Spt6p and its orthologues, the catalytic residues are substituted indicating that they lack the enzymatic function of resolvases [(PUBMED:10982859)]. Spt6p has been implicated in transcription initiation [(PUBMED:12934008)] and in maintaining normal chromatin structure during transcription elongation [(PUBMED:12934008)]. Horizontal gene transfer, lineage-specific gene loss and gene family expansion, and non-orthologous gene displacement seem to have been major forces in the evolution of HJRs and related nucleases. The diversity of HJRs and related nucleases in bacteria and archaea contrasts with their near absence in eukaryotes. The few detected eukaryotic representatives of the endonuclease fold and the RNase H fold have probably been acquired from bacteria via horizontal gene transfer. The identity of the principal HJR(s) involved in recombination in eukaryotes remains uncertain; this function could be performed by topoisomerase IB or by a novel, so far undetected, class of enzymes. Likely HJRs and related nucleases were identified in the genomes of numerous bacterial and eukaryotic DNA viruses. Gene flow between viral and cellular genomes has probably played a major role in the evolution of this class of enzymes. 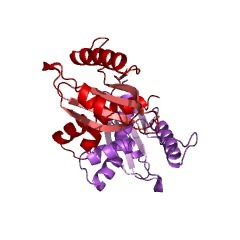 The YqgF domain is also found in Tex proteins, where maintains the core structural elements and aligns especially well with RuvC nucleases, although Tex does not appear to possess nuclease activity [(PUBMED:18321528)]. 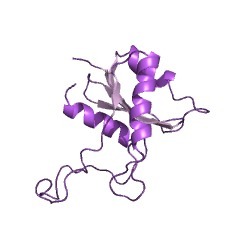 Tex (toxin expression) is a highly conserved bacterial protein involved in expression of critical toxin genes [(PUBMED:8755871)]. There are 34959 YqgFc domains in 34958 proteins in SMART's nrdb database. Taxonomic distribution of proteins containing YqgFc domain. This tree includes only several representative species. The complete taxonomic breakdown of all proteins with YqgFc domain is also avaliable. Click on the protein counts, or double click on taxonomic names to display all proteins containing YqgFc domain in the selected taxonomic class. Novel domains and orthologues of eukaryotic transcription elongation factors. The passage of RNA polymerase II across eukaryotic genes is impeded by the nucleosome, an octamer of histones H2A, H2B, H3 and H4 dimers. More than a dozen factors in the yeast Saccharomyces cerevisiae are known to facilitate transcription elongation through chromatin. In order to better understand the evolution and function of these factors, their sequences have been compared with known protein, EST and DNA sequences. Elongator subcomplex components Elp4p and Elp6p are shown to be homologues of ATPases, yet with substitutions of amino acids critical for ATP hydrolysis, and novel orthologues of Elp5p are detectable in human, and other animal, sequences. 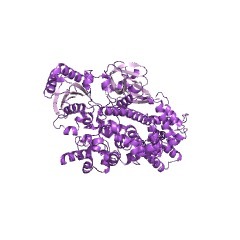 The yeast CP complex is shown to contain a likely inactive homologue of M24 family metalloproteases in Spt16p/Cdc68p and a 2-fold repeat in Pob3p, the orthologue of mammalian SSRP1. Archaeal DNA-directed RNA polymerase subunit E" is shown to be the orthologue of eukaryotic Spt4p, and Spt5p and prokaryotic NusG are shown to contain a novel 'NGN' domain. 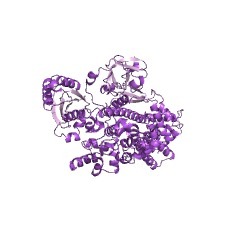 Spt6p is found to contain a domain homologous to the YqgF family of RNases, although this domain may also lack catalytic activity. These findings imply that much of the transcription elongation machinery of eukaryotes has been acquired subsequent to their divergence from prokaryotes. SURVEY AND SUMMARY: holliday junction resolvases and related nucleases: identification of new families, phyletic distribution and evolutionary trajectories. 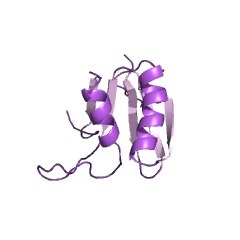 Holliday junction resolvases (HJRs) are key enzymes of DNA recombination. A detailed computer analysis of the structural and evolutionary relationships of HJRs and related nucleases suggests that the HJR function has evolved independently from at least four distinct structural folds, namely RNase H, endonuclease, endonuclease VII-colicin E and RusA. The endonuclease fold, whose structural prototypes are the phage lambda exonuclease, the very short patch repair nuclease (Vsr) and type II restriction enzymes, is shown to encompass by far a greater diversity of nucleases than previously suspected. This fold unifies archaeal HJRs, repair nucleases such as RecB and Vsr, restriction enzymes and a variety of predicted nucleases whose specific activities remain to be determined. 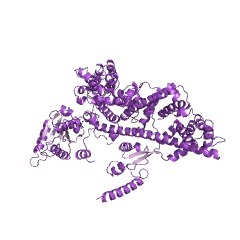 Within the RNase H fold a new family of predicted HJRs, which is nearly ubiquitous in bacteria, was discovered, in addition to the previously characterized RuvC family. 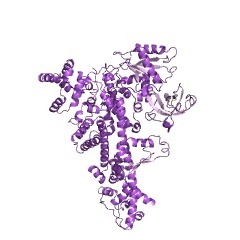 The proteins of this family, typified by Escherichia coli YqgF, are likely to function as an alternative to RuvC in most bacteria, but could be the principal HJRs in low-GC Gram-positive bacteria and AQUIFEX: Endonuclease VII of phage T4 is shown to serve as a structural template for many nucleases, including MCR:A and other type II restriction enzymes. Together with colicin E7, endonuclease VII defines a distinct metal-dependent nuclease fold. As a result of this analysis, the principal HJRs are now known or confidently predicted for all bacteria and archaea whose genomes have been completely sequenced, with many species encoding multiple potential HJRs. Horizontal gene transfer, lineage-specific gene loss and gene family expansion, and non-orthologous gene displacement seem to have been major forces in the evolution of HJRs and related nucleases. A remarkable case of displacement is seen in the Lyme disease spirochete Borrelia burgdorferi, which does not possess any of the typical HJRs, but instead encodes, in its chromosome and each of the linear plasmids, members of the lambda exonuclease family predicted to function as HJRs. The diversity of HJRs and related nucleases in bacteria and archaea contrasts with their near absence in eukaryotes. The few detected eukaryotic representatives of the endonuclease fold and the RNase H fold have probably been acquired from bacteria via horizontal gene transfer. The identity of the principal HJR(s) involved in recombination in eukaryotes remains uncertain; this function could be performed by topoisomerase IB or by a novel, so far undetected, class of enzymes. Likely HJRs and related nucleases were identified in the genomes of numerous bacterial and eukaryotic DNA viruses. Gene flow between viral and cellular genomes has probably played a major role in the evolution of this class of enzymes. This analysis resulted in the prediction of numerous previously unnoticed nucleases, some of which are likely to be new restriction enzymes. Conserved domains in DNA repair proteins and evolution of repair systems. A detailed analysis of protein domains involved in DNA repair was performed by comparing the sequences of the repair proteins from two well-studied model organisms, the bacterium Escherichia coli and yeast Saccharomyces cerevisiae, to the entire sets of protein sequences encoded in completely sequenced genomes of bacteria, archaea and eukaryotes. Previously uncharacterized conserved domains involved in repair were identified, namely four families of nucleases and a family of eukaryotic repair proteins related to the proliferating cell nuclear antigen. In addition, a number of previously undetected occurrences of known conserved domains were detected; for example, a modified helix-hairpin-helix nucleic acid-binding domain in archaeal and eukaryotic RecA homologs. There is a limited repertoire of conserved domains, primarily ATPases and nucleases, nucleic acid-binding domains and adaptor (protein-protein interaction) domains that comprise the repair machinery in all cells, but very few of the repair proteins are represented by orthologs with conserved domain architecture across the three superkingdoms of life. Both the external environment of an organism and the internal environment of the cell, such as the chromatin superstructure in eukaryotes, seem to have a profound effect on the layout of the repair systems. Another factor that apparently has made a major contribution to the composition of the repair machinery is horizontal gene transfer, particularly the invasion of eukaryotic genomes by organellar genes, but also a number of likely transfer events between bacteria and archaea. Several additional general trends in the evolution of repair proteins were noticed; in particular, multiple, independent fusions of helicase and nuclease domains, and independent inactivation of enzymatic domains that apparently retain adaptor or regulatory functions.